What you can learn determines what you are interested in and how you may behave. This new study upends models of how the brain constructs interpretations of the outside world. The research could shed light on phenomena ranging from eyewitness testimony to stereotyping to autism. Ning Qian, PhD, is exploring how the brain makes sense of the world we see and trying to explain why people with autism often find it difficult to look at faces. For neuroscientist Ning Qian, PhD, studying how we see the world around us is personal. Dr. Qian has a problem with his own vision: He cannot recognize faces well, though you would never know it from his warm smile and easy conversational style. Unable to tell his friends and family apart at a glance, he instead listens carefully to the sound of their voices and watches for distinctive body language. Sometimes he makes an educated guess based on context. More than once, he has greeted the wrong person. As a theoretical neuroscientist and visual psychophysicist, Dr. Qian uses math to reveal the brain’s calculations that give us the power to see. He then tests those theories by measuring how people actually see. Working with Zuckerman Institute principal investigator Misha Tsodyks, Dr. Qian is currently investigating what calculations the brain does to combine details and overall sight. Scientists know that the brain processes small pieces and parts of what it sees (a curve or a nose, for instance) before putting them together into a big picture (a scene or a face, for instance). But the brain also seems to be able to spot global patterns in the big picture, getting the gist of a scene or identifying expressions on face. That fast global perception should be useful for an animal trying to recognize a predator in the wild — or a human being trying to recognize his child at a playground. Working out this interplay between details and the big picture and how it helps us make sense of faces could also help us better understand autism. People with autism often focus on details and have difficulty interpreting facial expressions. That might be because they see faces differently. “Children with autism might have a different learning style, a different way of extracting information from the environment,” said Dr. Qian. He suspects that the autistic brain favors rote memorization of details at the expense of spotting general patterns that can be extrapolated to new and unfamiliar situations. Confronted with an unfamiliar face or face seen from a new angle, a person with autism may fail to interpret the suite of features as indicating happiness. She may instead rifle through a mental catalog of the faces she has seen before, trying to find an exact visual match. The difficulty in finding this match could explain why individuals with autism often have difficulty looking people in the face. “If I have trouble learning facial expressions, why would I want to look at a face? How you learn determines what you’re interested in and therefore how you behave,” said Dr. Qian. 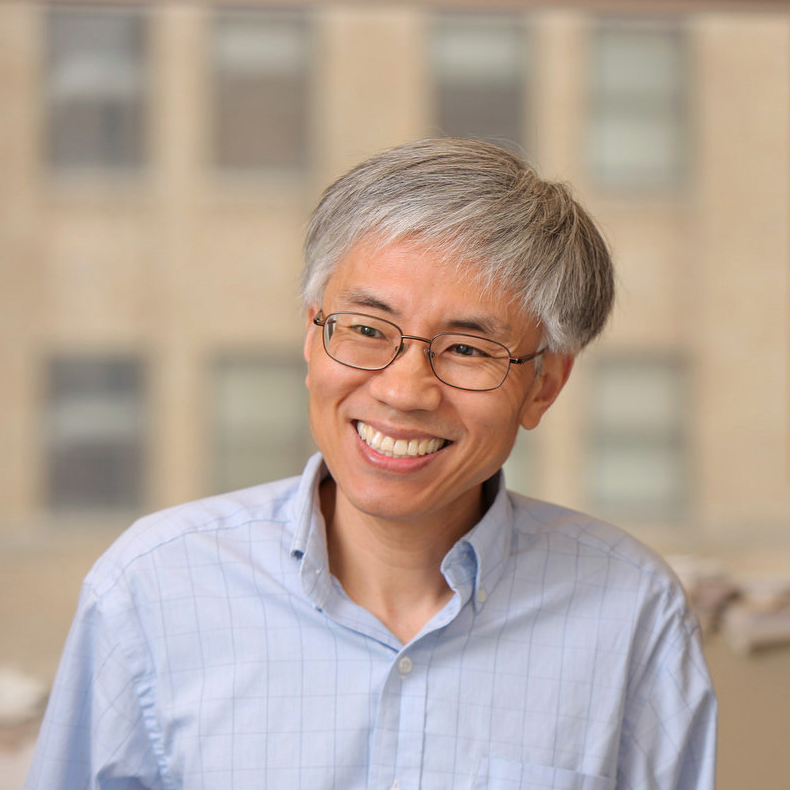 Understanding how the brain makes sense of facial attributes is a challenge, but Dr. Qian has decades of experience studying simpler building blocks of vision. In the past, he has explored how the brain judges depth, motion, and orientation, and integrates these features. His first foray into vision science occurred while he was earning his PhD at Johns Hopkins University. In 1983, Dr. Qian had come to the United States from China to study physics and then biophysics. Anti-intellectual policies during Cultural Revolution had blocked him from studying science until his last semester in high school. Hungry to learn, the young graduate student began working on protein structures. But he soon realized that he had trouble seeing 3D structures from figures of papers he read — not because there was anything wrong with the figures, but because of another problem: his vision. In addition to difficulties with faces, Dr. Qian has poor binocular depth perception, or stereo vision. Coincidentally, the lab happened to be researching depth perception. Abandoning proteins, Dr. Qian shifted his interest to how we see the world in 3D. Sites of overt and covert attention define simultaneous spatial reference centers for visuomotor response. Solving stereo transparency with an extended coarse-to-fine disparity energy model. The company they keep: background similarity influences transfer of aftereffects from second- to first-order stimuli. Movement duration, Fitts's law, and an infinite-horizon optimal feedback control model for biological motor systems. A learning-style theory for understanding autistic behaviors.